MD Phil Jones giving a talk to students. Brother hosted an event on Friday which brought together 50 students from local Tameside schools and taught them about apprenticeships. The day was hosted by Brother UK employees who went through the apprenticeship programme themselves. It was part of the government-run National Apprenticeship Week 2018 and focussed on this year’s theme of showcasing how opportunities work to benefit individuals, employers, the community, and the wider economy. 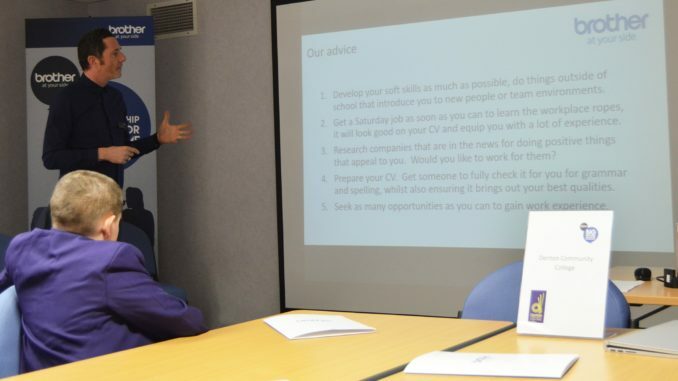 Attendees of the event were provided with information about apprenticeships which highlighted the benefits of working and studying simultaneously, as well as specific opportunities offered at Brother UK, one of Greater Manchester’s leading employers. Phil Jones, MD of Brother UK, said prior to the event: “National Apprenticeship Week is an important part of the year in highlighting the crucial role apprenticeships play in the future of all businesses, allowing us to celebrate the valuable contribution they make to companies. 5% of Brother UK’s current workforce are apprentices, and the company plans to recruit more across the business this year across areas including IT infrastructure, product & solutions management, and electronic engineering. Jones continued: Young people need real-life experience in business. It strengthens their employability and helps them make more informed choices about their future careers. The benefits for employers are huge as well, as millennials have invaluable digital, communication and social skills that are essential for our market.